Signature Bank Launches Service Enhancing Client Debit Card Security | Locally owned and operated community headquartered in Sandy Springs, Georgia. 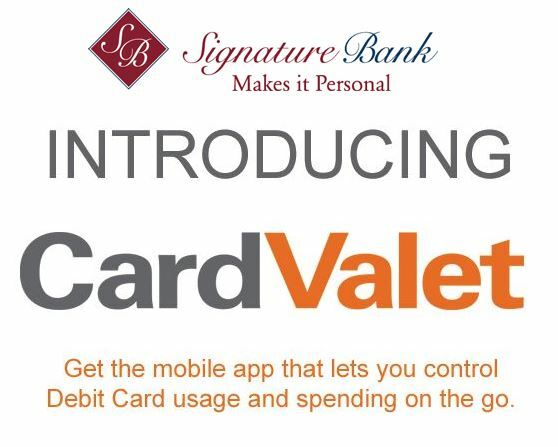 Sandy Springs, Georgia, June 28, 2017	(Newswire.com) - Signature Bank has launched an incredibly convenient new service to their debit card clients which enhances client control and security. Freddie Deutsch, Signature Bank President & CEO, states, "This may be one of the most valuable services we've launched for our clients in the last year. In today's world of criminal activity associated with electronic fraud and theft, it gives our clients total control of their debit card activity. Being able to instantly turn your debit card on and off creates a peace of mind that we've not been able to offer before." Other valued services that have been introduced over the last year include instant issue debit cards, an enhanced online banking experience, a 48-Hour conditional loan approval program for businesses and most recently a newcomer program. Due to the explosive growth within a three mile area of the bank office, the newcomer program offers benefits geared toward new residents moving into the Sandy Springs area, encouraging residents to shop, work, play and bank locally. Everything Signature does is first evaluated from a client perspective because our promise is to always Make It Personal. 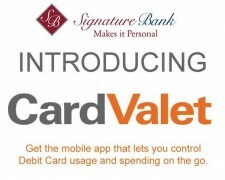 Learn more about Signature Bank by visiting www.SignatureBankGA.com and www.SBALoansAtlanta.com. Established in 2005, Signature Bank of Georgia is the only locally owned and operated community bank headquartered in Sandy Springs, GA. The bank offers a full range of business and consumer deposit products and loans in the metropolitan Atlanta area and throughout the state of Georgia and is a preferred lender with the Small Business Administration. Giving back to the community is an integral part of the bank’s mission.Signature Bank of Georgia is located at 6065 Roswell Road, between Hammond and Hilderbrand Drives. For more information, visit the bank’s website at SignatureBankGA.com or call Lawanna Saxon, Managing Director of Marketing at (404) 256-7702.